Shippers and carriers alike appreciate the simplicity of the Dairy.com Transportation Market. Shippers receive an opportunity to post loads and take advantage of a centralized view of product movement across the food-grade tanker community. Haulers find customers and revenue opportunities through the low cost/no risk filling of empty miles. Transportation Market participants find two avenues of opportunity: contract market transactions for planned shipments, and spot market transactions for non-contractually scheduled shipments. If a shipper schedules transportation on Dairy.com, a specific transportation contract is set up for each product transaction. As a result, haulers are electronically notified of each load that requires their acceptance. During this process, data is accumulated for reporting and for reconciling with a shipper’s accounts payable department. With a few clicks, shippers can make loads available simultaneously to several hundred tanker haulers. Haulers compete for the best opportunities and benefit from drastically reducing backhauls. Online negotiations are quick and simple. Since 2002 the Transportation Market has connected bulk dairy commodity shippers with qualified food-grade tanker haulers, creating a “win-win” hub for all parties. Dairy.com users have reported savings on freight rates of up to 50% versus their regular spot or contract rates. There are no membership, subscription, or setup fees to use the Dairy.com Transportation Market. Additionally, users may post or bid on loads at no cost. Put an end to the expensive “deadhead” miles that are costing your business. Haulers are automatically notified by email when shipments are available. The Dairy.com carrier base can cover virtually any load, anywhere at an attractive price. Perform transportation price discovery with minimal effort—an invaluable tool in negotiations to buy or sell dairy products. Online carrier acceptance, load bidding, fuel surcharge calculation/application, and 24/7/365 support from Dairy.com. 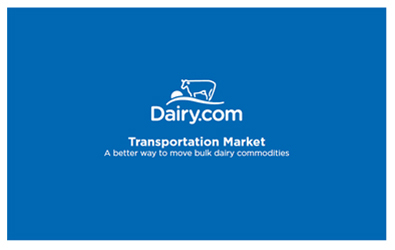 Everything you need to know about the Dairy.com Transportation Market in about 5 minutes. Available now for instant download. View opportunities, submit bids, make deliveries, get paid.